Band Members: Ryan Grisham, Heath Metzger, Joe Asher, and Zach Grace. The Rundown: Mock Orange, hailing from Newburgh, Indiana, USA, are an Indie/Alt Rock band. This little group has been around since 1993. I bet you’ve heard this band, even if you’ve never heard of this band. Mock Orange has had their music used extensively by numerous different TV Shows like, CSI: Miami, 16 and Pregnant, Greek, Fox Sports, ESPN2, DVDs and movies such as Tony Hawk, The Vicious Kind and many more. Mock Orange has released 12 albums and EPs: “Open Sunday” (1995), “Mock Orange” (1997), “Nine & Sixes” (1998), “The Record Play” (2000), “Amplified” (2000), “First EP” (2002), “Mind is Not Brain” (2004), “Live At Schubas” (2004), “Daniel’s EP” (2006), “Captain Love” (2008), “Live in Brooklyn” (2009), “Disguised As Ghosts” (2011). Consisting of Ryan Grisham (Guitar, Lead Vocals), Joe Asher (Guitar, Backing Vocals), Heath Metzger (Drums), (formerly Brendon Chapell (Bass Guitar 1993-2002) ), and Zach Grace (Bass Guitar, Backing Vocals 2002–present), Mock Orange has been rocking out since the mid 90’s and have survived the death of Kurt Cobain, Y2K, Global Warming, and a brush with the “Dark Side”. In 2002 George Lucas sued Mock Orange’s label, Dead Droid Records, for copyright infringement. Ultimately, Dead Droid Records crumbled and Mock Orange was forced to find a new label, which they did. The “Dark Side” was not victorious. 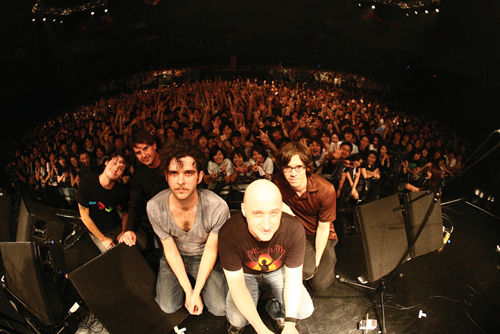 The adversity must have helped the band with material because their next album after the lawsuit, “Mind is Not Brain“, garnered massive applause from the national critics. If you like Modest Mouse you will love Mock Orange because they, at times, sound similar to Modest Mouse, only a ton better. The lyrics are always brilliantly crafted and sung with a soft, yet spirited message. The rhythms the guitars produce is my favorite part of the band. Not to take anything away from their lyrics or vocals, but the skillful way in which the guitars are used in this band, especially in the “Captain Love” and “Mind is Not Brain” albums, makes me all warm and fuzzy inside. MarsBands.com approves of the Orange.